Repast (1951), Mikio Naruse’s first adaptation of the work of celebrated Japanese novelist Fumiko Hayashi, is one of his very finest films, a deceptively simple examination of a troubled marriage, told with the penetrating insight and elegant images that made Naruse such an extraordinary artist. It features one of the greatest performances by the luminous Setsuko Hara, who was a master of gesture and glances which reveal her character without any dialogue needing to be spoken. Her line readings and inflections, sighs, and exclamations all draw us in and make us sympathize with this often opaque, mysterious and forbidding character. At the outset, Michiyo (Hara) is growing bored and frustrated with what she sees as her endlessly monotonous existence, cooking, cleaning, and looking after her husband, Hatsunosuke (Ken Uehara). She seems to reserve most of her affection for her cat, Yuri. However, the couple seems to have reached a state of equilibrium in this situation, in which they have managed to submerge their mutual unhappiness beneath banal pleasantries. This delicate balance is upset by the arrival of Hatsunosuke’s niece Satoko (Yukiko Shimazaki), a flighty young woman who comes to their house for a refuge from her father and her impending marriage. 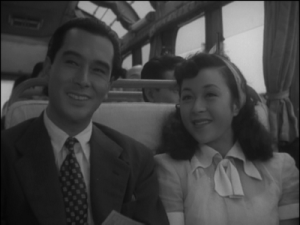 To Michiyo’s dismay and growing anger, Hatsunosuke begins to lavish attention on his pretty and flirtatious niece, going with her on a bus tour of Osaka (which includes one of the film’s loveliest moments, when the cheerful tour guide suddenly breaks out into song), and seeking his own refuge from his unexciting home and office life. These and other events drive Michiyo to the breaking point, until she finally leaves home and stays at her parents’ house in Tokyo and even considers staying there to find a job. Like most of Naruse’s films, most of the characters are unhappy, and this is their default mode. But as the final sublime moments prove, it is possible to find small moments of grace and greater meaning within this existence. As such, for me personally, this is a great film with which to end the year. Although as meticulous and precise in its own way as that other great master of Japanese cinema, Ozu, Naruse’s style is nearly invisible and quite naked, all the more for us to feel intensely for these characters and their struggles, even though it may on the surface seem quite artless and mundane. And as presented in a beautiful transfer from Masters of Cinema, which includes a nicely written booklet with articles by Audie Bock, Catherine Russell, and Phillip Lopate, and insightful audio commentary by Lopate and Kent Jones, Repast never ceases to amaze with its nearly effortless sublimity, representing the art of cinema at its finest. 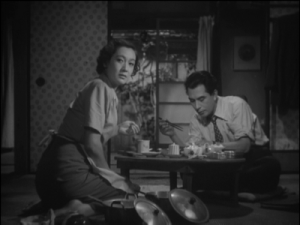 Repast is included in a box set which includes two of Naruse’s other 50’s films, Sound of the Mountain (1954) and Flowing (1956). Taken together, they are an excellent introduction to one of cinema’s greatest artists.